Fire crews were alerted after a youngster claimed his seven-year-old friend was trapped underneath the vehicle in Leigh last night. But the emergency turned out to be a hoax and fire bosses now want to stress to parents and youngsters how dangerous such calls can be. Crew manager Andrew Kopicki said: "We received a call from a public telephone box in Coronation Drive. 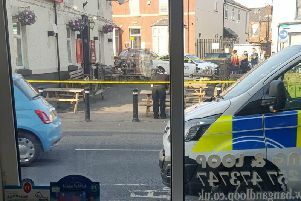 "The caller said that a male aged seven was pinned underneath a car so there was a quite a significant response by ourselves and the ambulance service to this kind of incident." Up to four fire engines and a fast-response paramedic car could be expected to turn out in the circumstances, he added. An emergency call handler from fire headquarters believes that the caller may have been of a similar age to the bogus "victim". Mr Kopicki added: "This kind of response could strip a whole borough of fire appliances, which would delay anyone else who needed assistance in the area. "There are also the implications of that amount of blue-lighted vehicles heading to the scene. "Our drivers are trained to prevent any collisions but there is always the dangers associated with other motorists taking evasive actions."